I may already be in Scotland by the time you read this, perhaps on the Isle of Arran, touring Brodick Castle or walking amongst the rhododendrons in the walled garden. Perhaps we’ll be checking out of Lilybank Guest House, or on the ferry, headed to Craig Villa Guest House, near Loch Awe and St. Conan’s Kirk. I was last in Scotland nine years ago, and have been longing to return for at least five. Thistle Down, Wild Rose, Blue Belle, Shy Violet and Sweet William have kept images of picturesque kirks and castles, hairy coo, grazing sheep, colorful villages, white sand beaches, stone cottages and heather-covered hills fresh in my mind, but I think the need to be there in person, experiencing it firsthand, is born of a more ancient connection. Although my Mom’s family, the Lightlys, were from England, my grandma and now mother have long told me about a supposed Scottish great-great grandmother. My English ancestors lived in the north part of Lincolnshire, near a village called Scotton. My family tree is leafed with names like Scullin, Maltby, Harrison, and Mcintyre, and in my searches of the generations, I just found a reference to the Shetland Islands. Scotland in my blood. I feel it when I hear the bagpipes, the drums, or a Scottish accent. I feel it when I see a parade of men in kilts marching down the field, when I look out over the sheep grazing, when I see fields of purple heather in the highlands. 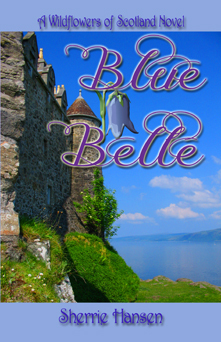 Researching my novels (and watching Outlander – my guilty pleasure) has only fueled my passion for kilts, castles, highlanders, and all things Scottish. I’ve always known I come from hardy stock with a history of eking out a living in a part of the country that’s sometimes brutally cold and harsh. I love the sea, and rocks, and find a great affinity in the creative, yet no-nonsense foods, cottage décor, and crafts of Scotland. I love that the colorful wildflowers and woven plaids of the highlands are such a contrast to the gray and brown stone cottages lining the valleys and lochs. There is something primal and instinctual that binds me to the Scots. I have no idea if a new book will be born of this journey to the motherland. 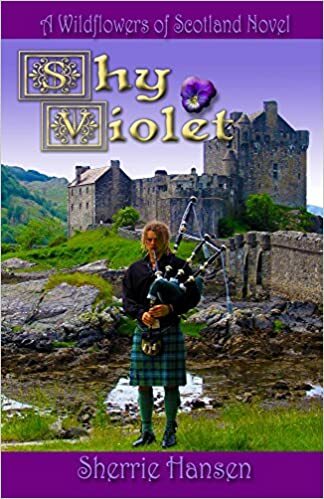 I’ve labeled Sweet William (coming soon from Indigo Sea Press) as the last of my Wildflowers of Scotland novels, but I named Violet’s baby Heather, leaving the door open for a look-ahead novel some two decades down the road. And there’s always Red Jasmine, Blue-eyed Mary, Cherry Primrose, Bee (Bea) Orchid, Golden Rod, Lily of the Valley, Seaside Daisy, Mountain Laurel, and other names I can use if I change my mind. My main goal is just to relax and enjoy Scotland’s magnificent scenery and history. Everyone keeps telling my husband and me to travel while we can, so we plan to keep returning to Europe as long as we’re able – hopefully every year. When he and Mom arrived in Germany, with expensive tickets and a locked in return date, he had no choice but to relax and enjoy himself. This was before the days of email, Skype, texting with international minutes, or cheap long distance. Dad had no idea what was happening on the farm, and even if he had known, there was absolutely nothing he could have done about it. I saw a completely different side of my Dad on that trip. His sense of humor shone – he laughed and smiled and chatted with strangers and truly relaxed. It was amazing. He was like a new person. The same kind of magical transformation occurs between me and my husband when we travel. We get to know each other all over again. We rediscover ourselves when we forget the stresses of being a frustrated business owner and a busy pastor. We set aside the issues we’re preoccupied with and reconnect. Our tired brains and downtrodden psyches rejuvenate. Our bodies start to thrive again. I hope you’ll come along on our journey. You can follow me on Facebook or Instagram to see my photos, or wait for my next installment at Indigo Sea’s blog. Sweet William should be ready to release just about the time I return from Scotland. I’ll do my best to bring it to life for you in the meantime. Twenty-five years ago, Sherrie rescued a dilapidated Victorian house in northern Iowa from the bulldozer’s grips and turned it into a bed and breakfast and tea house, the Blue Belle Inn. 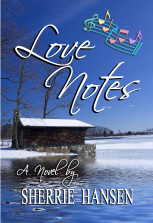 After 12 years of writing romance novels, Sherrie met and married her real-life hero, Mark Decker, a pastor. They now split their time between 2 different houses, 85 miles apart, and Sherrie writes on the run whenever she has a spare minute. Sherrie enjoys playing the piano, photography, traveling, and going on weekly adventures with her nieces and nephew. 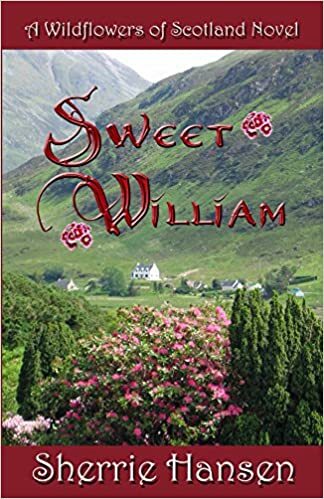 “Sweet William”, Sherrie’s ninth book and the last of her Wildflowers of Scotland novels, is coming soon from Indigo Sea Press. Have you ever noticed that in many novels, the mothers of the main characters are conveniently vacationing in some remote spot on the other side of the globe, or even dead? Having grown up in a family where my mother and grandmothers, even my aunts and cousins, were involved in almost every aspect of my life, I have a hard time relating to a world without a mother’s magic. 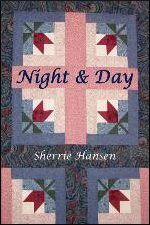 When I was 9 years old, I joined 4-H and got sent to Aunt Shirley’s house (my dad’s sister, who is married to my mom’s brother) to learn how to sew. I remember getting into arguments with my mother when she told me a seam was crooked and had to be ripped out. When Aunt Shirley told me something needed to be redone, I very meekly said, “Okay,” and did it over until I got it right. From that time on, I made most of my own clothes. Going to Dorothy’s Fabric Store in downtown Austin, Minnesota to pick out fabric and notions was an adventure that was shared with the extended family, too. The first thing Mom did when we found a time when we could go to town – preferably without my little sisters and brothers – was to call my grandmas and aunts and invite them to meet us at the fabric store. I can still remember them crowding around me, holding this and that bolt of fabric close to my face, giving their opinions on what color looked best on me and reminding me that vertical stripes were the most flattering to my figure. Which fabric would work well with the pattern we had selected and what kind of cloth would hang right and stand up well under repeated washings were important considerations, too. Dry-clean-only fabric wasn’t even considered because of the extra cost of upkeep. Anything on the clearance rack was given double consideration. 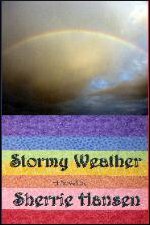 Their favorite materials were the rainbow selection of polyester double knits, considered a modern miracle of inventions because the seams didn’t ravel, it didn’t have to be ironed, and it was practically indestructible. When the fun part came – deciding which buttons would accent the fabric to its best advantage and what kind of zipper was easiest to put in – options were discussed at length, a truly matriarchal affair. Perhaps the fact that my mom, grandmas, and aunts were so involved in my life would have driven some teenagers to madness, but it made me feel surrounded by love, special, and deeply cared for. To this day, I have trouble making decisions by myself and almost always call my mom or dad to see what they think I should do before making a major purchase. I still think about calling my grandmas for advice when I’m stumped even though they’ve been gone for over a decade. I’m blessed to have both parents living and hope it stays that way for a good long time. As for writers who leave mothers out of their fictional equations and plotlines, I would say that they’re missing out on some of the best fodder for character development – and yes, conflict – there is. Mothers and daughters have a very unique relationship. They love, they adore, they disagree, they despise. The imprint our mothers make on us, good or bad, affects us more deeply than anything else in life. And what is more endearing and heroic than a son who loves and respects his mother? Mothers know their children inside and out. They meddle. They make us laugh – they break our hearts. Mothers are our biggest cheerleaders and our worst critics. They’re not afraid to say what they think, and they sometimes don’t approve of the choices we make. And they show us the true meaning of love, over and over and over again. In Sweet William, Lyndsie’s mother (Kelly, who you’ll remember from Wild Rose), and her Aunt Rose, are very influential figures who chide, defend, and lend a listening ear. William’s mother, who is convinced Lyndsie made everyone at their family gathering sick when she served them her homemade smoked haddock pies, takes an instant dislike to the lass her son is in love with, putting William in a very awkward position. To see how it all ends, you’ll have to read the book. Mothers really do make the world go round. Without them, nothing would be as it is – we wouldn’t exist. 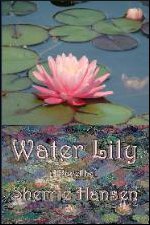 A mother’s magical presence, woven into the plotline of a novel, may not be as high intrigue or titillating as murder and mayhem, but it can tear at the soul and tickle the heartstrings like no other relationship. If you sometimes take your mother for granted, be sure to give her a hug and tell her how much you love her this Mother’s Day. Next time you read a book, think about how much impact a mother has on what’s happening between the main characters. There are fictional mothers we love, and those we hate, and those we feel lukewarm about, but whatever their make-up, they’re one of the – maybe the most – pivotal, primal component in our lives. Cherish your mom, today and always.